Andrew "Freddie" Flintoff MBE (born 6 December 1977) is an English former cricketer, Boxer and Current panelist and presenter . A former England Test international, he has also played for Lancashire, Chennai Super Kings in the IPL, and Brisbane Heat in the Big Bash League. Flintoff also competed once as a professional boxer in 2012. He now presents TV show Cannonball which debuted on 2nd September 2017. A tall fast bowler, batsman and slip fielder, Flintoff was consistently rated by the ICC as being among the top international all-rounders in both ODI and Test cricket. Following his debut in 1998, he became an integral player for England, serving as both captain and vice-captain of the team. However, he suffered regular injuries throughout his international career, often due to his heavy frame and bowling action. During the period 2007–09 he played in only 13 of England's 36 Test matches, but nevertheless remained a core member of the England squad, being selected whenever available. On 15 July 2009, he announced his retirement from Test cricket at the conclusion of the 2009 Ashes series, on 24 August, and although he made himself available for future commitments in One Day International and Twenty20 International matches, it was reported on 7 September 2009 that he had developed deep vein thrombosis after surgery to his knee, and on 16 September 2010, he announced his retirement from all cricket. He then had one professional boxing engagement on 30 November 2012 in Manchester, beating American Richard Dawson on a points decision. In May 2014, Flintoff came out of retirement after five years to play Twenty20 cricket for Lancashire again, before being signed by Brisbane Heat to play in the Australian Big Bash League for the 2014–15. After a poor season with the Heat, he announced his final retirement. On 15 March 2015, Flintoff won the first series of the Australian version of I'm a Celebrity...Get Me Out of Here!. Flintoff also hosted the 2015 series "Special Forces – Ultimate Hell Week," which saw contestants put through their paces by veterans in the army from all over the world. Since his retirement, Flintoff has been involved with numerous projects, including designing his own range and becoming the face of fashion brand Jacamo, and has been part of the Sky 1 sports based comedy panel show A League of Their Own. Flintoff's father Colin was a plumber and factory maintenance worker and the captain of Dutton Forshaw second XI cricket team. Andrew attended Greenlands Community Primary School and Ribbleton Hall High School (subsequently renamed City of Preston High School [now closed]) where he performed well academically, passing nine GCSEs, but he did not want to stay in education and left school at 16. As a boy he played cricket for the Lancashire Schools under-11s and under-15s teams and he was also a keen chess player. He then played for 2½ years in the England under-19 team. Flintoff was captain of the England Under-19 team for their "Test" match tour to Pakistan in 1996/7 and at home against Zimbabwe in 1997. 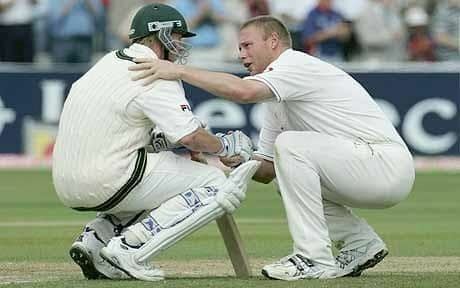 He made his Test match debut for England in 1998 against South Africa at Trent Bridge, in a match remembered for its second-innings duel between Mike Atherton and Allan Donald; in a precursor to their subsequent all-round rivalry, Flintoff and Jacques Kallis exchanged wickets. Nonetheless, his struggle to make the grade at county level continued, he found form only intermittently, though often explosively when he did so. In 2000, he hit 135 not out in the Quarter-finals of the Natwest Trophy against Surrey, which David Gower described as "the most awesome innings we are ever going to see on a cricket field". 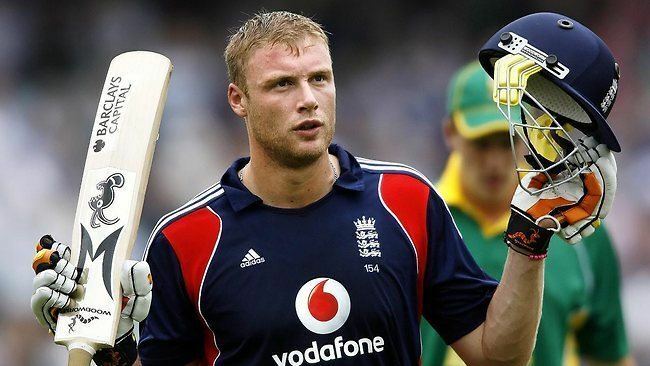 In the same year England's management made clear they were unhappy with his fitness and weight, Flintoff responded to his critics with 42 not out in a one-day game against Zimbabwe on his home ground of Old Trafford, forming an explosive second wicket stand with Graeme Hick; as he collected the Man of the Match award he remarked his performance was "not bad for a fat lad". Although he lost his England place during 2001, he remodelled his bowling action and gained a place on the 2001–02 tour to India. Though he hit possibly his worst international batting form during the Test series, frustrating him to the point that he broke down in tears in the dressing room at one stage, he later saw the tour as a turning point in his career, specifically the crucial final one-day match. Entrusted with bowling the final over with India needing 11 to win, he ran out Anil Kumble and bowled Javagal Srinath with successive balls to win the match, taking off his shirt in celebration, which was mimicked by Sourav Ganguly in a later match. In 2002, he scored his maiden Test century. By 2003, a newer, fitter Flintoff started to justify the comparisons with Botham. Up to the end of 2002, he had averaged just 19 with the bat and 47 with the ball; from 2003 to the end of the 2005 Ashes series, the corresponding figures were 43 and 28. In the summer of 2003 he scored a century and three fifties in the five Test series against South Africa at home, and continued to excel on the tour of the West Indies in March and April 2004, taking five wickets in the Test in Barbados, and scoring a century in Antigua. In early 2004 he was named as a Wisden Cricketer of the Year, having failed to make Wisden's top 40 list in 2002. Although injury prevented him from bowling, he was called into the England squad for the 2004 Nat West One Day International (ODI) Series against New Zealand and the West Indies as a specialist batsman, scoring two consecutive centuries in the series and hitting seven sixes in one innings. He matched this haul in the Second Test against the West Indies at Edgbaston in July, hitting a first-class best figure of 167. During this innings, watched by a crowd of 20,000, Flintoff hit a six into the top tier of the Ryder Stand. A man stood to claim the catch and dropped it – it was Flintoff's father. Over the course of England's record-breaking summer, he hit a half-century in all seven victorious Tests against New Zealand and the West Indies. On returning to the one-day game as an all-rounder in September he fell agonisingly short of a third one-day century, caught on 99 against India, though he went on to hit a further century in the ICC Champions Trophy pool match against Sri Lanka two weeks later. At the end of the season he was named as the inaugural winner of the ICC Award for one-day player of the year, and the Professional Cricketers' Association player of the year. He also became a father when his fiancée Rachael Wools gave birth to Holly on 6 September. They now have a second child, Corey, who was born during the series in India in 2006. Freddie briefly returned home from the tour to see his son for the first time. In the Second Test against Australia at Edgbaston in August 2005, he broke Ian Botham's 1981 record of six sixes in an Ashes Test Match with five in the first innings, and a further four in the second innings: he scored 141 runs in total. In the same game he took a total of seven wickets (across both innings), including the wickets of Langer and Ponting in his first over in Australia's run-chase. He managed all this despite a shoulder injury early in the second innings. England won the game by just two runs, and saved their hopes of regaining the Ashes. Flintoff was named 'Man of the Match' and captain Michael Vaughan subsequently dubbed the match "Fred's Test" in honour of his achievement. Flintoff scored a century during England's crucial win at Trent Bridge. He took five wickets on the fourth day of the final Test match, enabling England to go off for bad light and helping them eventually to secure a draw and regain the Ashes. In October 2005, Flintoff shared the Sir Garfield Sobers Trophy for the ICC player of the year award with Jacques Kallis of South Africa. In December 2005, Flintoff was crowned BBC Sports Personality of the Year for 2005, the first cricketer since Botham in 1981. 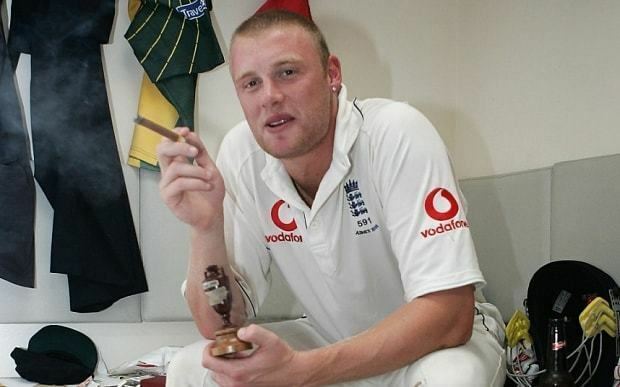 In the New Year's Honours List for 2006, Flintoff was appointed an MBE for his role in the successful Ashes side. In January 2006, Flintoff was presented with the Freedom of the City award for Preston, Lancashire. The award was presented to Flintoff by the Mayor of Preston. Other recipients of the award include Sir Tom Finney and Nick Park. By the end of the series, Flintoff was also a crock, succumbing to a further ankle injury that put his role in the winter's Ashes in doubt. Could this be traced back to the opening Test at Lord's when, in his first serious bowl of the season, and somewhat above his fighting weight, he bowled an excessive 68.3 overs and nothing above 85mph? He had gone from shock bowler to stock bowler – under his own captaincy, too. A recurrence of his long-term ankle problem in the Test series meant Flintoff missed both the ODI series against Sri Lanka, and the first Test against Pakistan. It was later announced in July that Flintoff's rehabilitation had not been sufficient to quell the injury, and that further surgery would be required. He was thus ruled out for the entire series against Pakistan. Despite injury concerns, Flintoff was later named for the ICC Champions Trophy, where he played as a specialist batsman, not as an all-rounder. After his previous stint as captain in the Test series against India, Flintoff returned as captain of the England team for the eagerly anticipated 2006-07 Ashes series in Australia. The series turned out to be a humiliating one for Flintoff, leading his side to five straight losses and thus losing the Ashes after having held them for the shortest time in history. In addition, he presided over England's worst ever defeat in an Ashes series, equalling the 1921 whitewash at the hands of the Warwick Armstrong-led Australian team in the wake of World War I.
Flintoff's own play in the 2006–07 series, both bowling and at the crease, was generally deemed disappointing. He made only two scores over 50 in the series, his best bowling figures were 4–99 in the first innings of the First Test in Brisbane, and he failed to take five wickets in a match. Flintoff played in only one first-class game in the lead up to the series. He was initially undone by Australia's excellent seam bowling but his batting improved throughout the series as he got more match practice. A persistent ankle injury prevented Flintoff from bowling long spells at full pace and Australia's batsmen took advantage of this. According to Nasser Hussain during the tour he also had three or four warnings for inappropriate behaviour and binge drinking, including arriving hung over for a training session. Flintoff also captained England for several of the subsequent 2006-07 Commonwealth Bank Series One Day International matches. Michael Vaughan's return from knee surgery was cut short by a hamstring injury and he was only able to play two matches, leaving Flintoff in charge for the remaining games. England qualified in the last game of eight group matches for the best-of-three finals against Australia, but reversed their poor form on tour with a 2–0 series win in the finals. Flintoff contributed significantly with the ball in both matches, taking three wickets in the first match and allowing only 10 runs off five overs in the second as Australia chased a reduced total in a rain-hit match. In the opening match of the tournament against New Zealand, Flintoff was out first ball in England's innings and, although his bowling was very economical, conceding only 17 runs in eight overs, he failed to take a wicket. He did, however, take a stunning one-handed catch at slip to dismiss Ross Taylor for a duck. On the evening of England's defeat Flintoff, along with some other players and coaches from the England squad, indulged in some late night drinking in a night club, only two days before their vital match against Canada. In the early hours of the morning, he reportedly had to be rescued after falling off a pedalo – this quickly became known in the media as the "Fredalo" incident. Flintoff and the others involved were reprimanded and fined, with Flintoff being stripped of the vice-captaincy. In addition, he was suspended for the match against Canada. It was revealed by England coach Duncan Fletcher that Flintoff had had a number of previous warnings about his behaviour. Flintoff has since issued a public apology, and later also clarified that he didn't actually "fall off" a pedalo, but rather failed in an attempt to board one. Flintoff returned to the England team for the last group match against Kenya, taking two wickets. In the Super 8 matches, Flintoff often excelled with the ball but failed to recover his batting form. Against Ireland he took 4–43 and scored 43 runs; against Sri Lanka he took 3–35 but was out for 2 and against Australia he took 1–35 but was out for 4. In the next match against Bangladesh Flintoff took 1–38 in eight overs and scored 23 runs off 21 balls. Ultimately, he failed to influence an ailing English side and had a poor tournament. Michael Vaughan later commented that Flintoff's pedalo antics had adversely affected team morale. 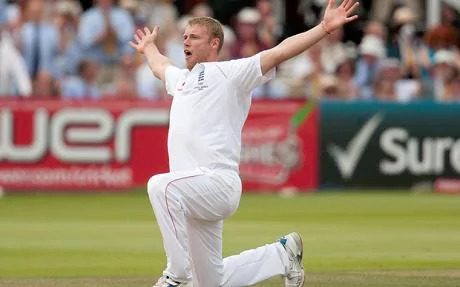 Flintoff returned for a couple of games with Lancashire, in preparation for the West Indies tour of England but he re-injured his ankle and was ruled out for the first Test which started on 17 May 2007. Having undergone another operation on the troublesome ankle, he missed the whole Test and one-day series against the West Indies, and was also ruled out for the subsequent Test series with India. Following several games for Lancashire, Flintoff returned for England in the first of seven ODIs against India on 21 August 2007. He bowled seven overs and ended with figures of one for twelve in England's 104-run victory. He hit an eventful nine runs during the second ODI; however, while fielding, he injured his knee and sat out England's 42-run victory in the third ODI. He returned for the fourth ODI on 30 August. Flintoff missed England's two narrow defeats to India in the fifth and sixth ODIs before taking 3–45 in the seventh, helping England to win the series four-three with a seven-wicket victory. Flintoff's ankle injury recurred during the end of the 2007 season, and, although he played in the 2007 ICC World Twenty20, he did not accompany the England squad to Sri Lanka, and a fourth operation made it highly unlikely that he would play again before the summer of 2008, missing both the Sri Lankan Test Series and the 2008 tour of New Zealand. Flintoff remained "upbeat" about his career, however. Flintoff was back in action for Lancashire early in the 2008 season, but a side strain ruled him out of contention for the home series against New Zealand. After again returning to action in county cricket he was recalled to the England squad for the second Test against South Africa, where he missed the last 17 Tests prior. He took his 200th Test wicket in the Third Test, trapping Neil McKenzie lbw for 72. Flintoff bowled consistently against the South Africans, but South African coach Mickey Arthur felt that he was too defensive. His batting also began to show promise as he consistently made starts, before being moved back up to bat at six when Kevin Pietersen took over as captain. In the following one day series, Flintoff was an important player for England, leading Pietersen to describe him as "a superstar". Flintoff scored 78 in both the first and the third matches – he was not required to bat in the second – as well as 31 not out off 12 balls in the fourth, whilst taking three wickets in the same match. This led many pundits to speculate that Flintoff might just be back to his best. He won Man of the Series in the ODI home series against South Africa, where England won four-nil: the last match was washed out. He was both the top run-scorer and the top wicket-taker of that series. Still, though, his want of consistency frustrated the pundits. "Flintoff," wrote Peter Roebuck some time later, "is a fine cricketer who has never quite worked out how he takes wickets or scores runs. Torn between hitting and playing, pounding and probing, he has performed below his highest capabilities." 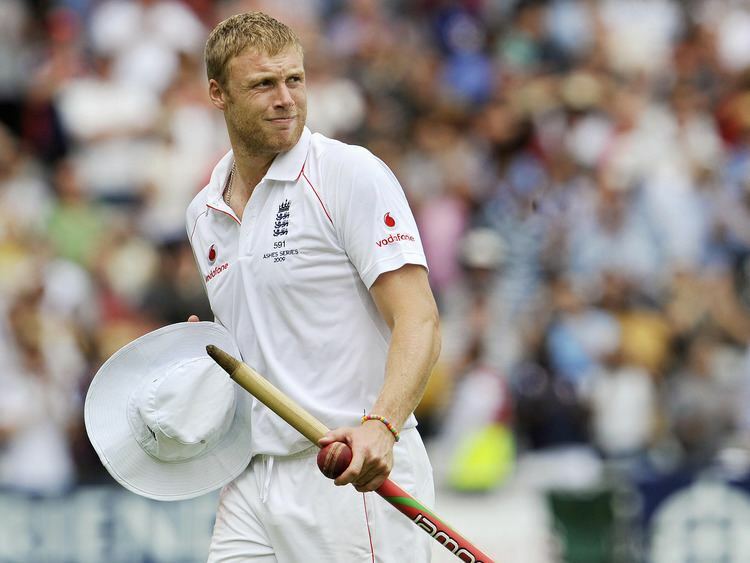 On England's tour of India, Flintoff started the series well. In the first warm-up match against the Mumbai Cricket Association, he scored exactly 100. It was his first century for England since the Fourth Test of the 2005 Ashes. His batting did not follow with similar successes in India and the West Indies, but his bowling remained strong, with a dozen wickets in the Caribbean at under 30 apiece, followed by a hat-trick in the final ODI series, becoming only the third English bowler ever to do so. In February 2009, the Chennai Super Kings of the Indian Premier League bought Flintoff for USD 1,550,000 – $600,000 above his base price of $950,000. This makes him the highest-ever-paid IPL player, alongside compatriot Kevin Pietersen, and surpasses Mahendra Singh Dhoni's $1,500,000. But Flintoff did not find success at the tournament, held in South Africa after the Mumbai attacks, as after a difficult first few matches he was sent home for surgery following another knee injury. However, speculation over Flintoff's form ahead of the much-awaited 2009 Ashes series died down as he took six wickets in his first match back for Lancashire and left "several county batsmen [...] nursing bruised ribs and fingers". He also collected a half-century against Hampshire, although he was still yet to register a century in either domestic cricket or any form of the international game since that Trent Bridge instalment of the last home Ashes in 2005, which year also accounted for his most recent Test five-for. "It's always been an Australian trait to over-rate players who have done well against them (just ask VVS Laxman)," wrote Lawrence Booth. "But in the case of Andrew Flintoff, this phenomenon is getting so out of control you wonder whether Steve Waugh has returned to orchestrate a cunning mind-game. [...] In any case, does anyone honestly think a player with his fitness record will make it through a five-Test series condensed into less than seven weeks?" Flintoff did offer some hope with the willow in the Twenty20 Cup, however, hitting 93 off 41 balls for Lancashire against Derbyshire in June. On 15 July 2009, Flintoff announced he would retire from Test cricket at the end of the 2009 Ashes Series. He said that "Since 2005 I have just been plagued with injury so I've got the opportunity now to finish on a high by helping England to win the Ashes and it will give me great pleasure if I can play my last Test at the Oval and we can win the Ashes – it doesn't get any bigger than that." He was man of the match in England's victory at Lords in the Second Test Match, taking 5 wickets in the second innings after a fine display of fast bowling and achieving the rare feat of making both Lord's Honours Boards. On 23 August 2009, England defeated Australia at The Oval to seal a 2–1 series win, with Flintoff notably running out the Australian captain Ricky Ponting, ensuring Flintoff ended his England career on a high. On 16 September 2010, Flintoff retired from all forms of professional cricket, having consulted medical advisers. He continued to play recreationally for Penwortham Cricket Club alongside his brother Chris Flintoff. Flintoff came out of retirement in May 2014, returning to Lancashire to play Twenty20 only. He featured in the final of the competition, dismissing Ian Bell with the ball and hitting two sixes in the penultimate over as Lancashire fell just short against Birmingham Bears. After this season he was signed by the Brisbane Heat in the Australian Big Bash League for the 2014–15 season. Flintoff disappointed on the field, ending the season with a high score of 46, with only one other score in double figures (15), along with three wickets at an average of 45.33. His real worth was in his persona both on and off the field. He had an on-field microphone for most matches and memorably sang In the Ghetto by Elvis Presley during one game while on air. He also began commentating matches for Network Ten. These experiences endeared him to Australian crowds, a far cry from his England days. After the 2014-15 Big Bash League season, he finally retired from cricket. He would be back for the 2015-16 Big Bash League season although, as a commentator for Network Ten. His newfound popularity in Australia enabled him to win the first series of the Australian version of I'm a Celebrity...Get Me Out of Here!. Flintoff is the third highest English wicket-taker in one-day international cricket with 168 wickets, and the 13th highest in Test cricket, with 219 wickets. These figures include wickets taken for the ICC World XI. He is also the ninth highest English run-scorer in one-day internationals, with a total of 2,975. 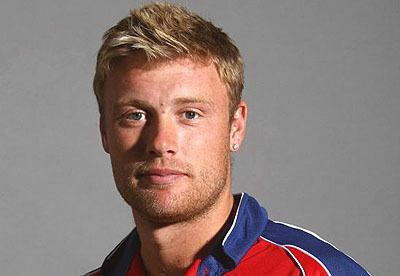 Flintoff was Lancashire's winner of the NBC Denis Compton Award in 1997. 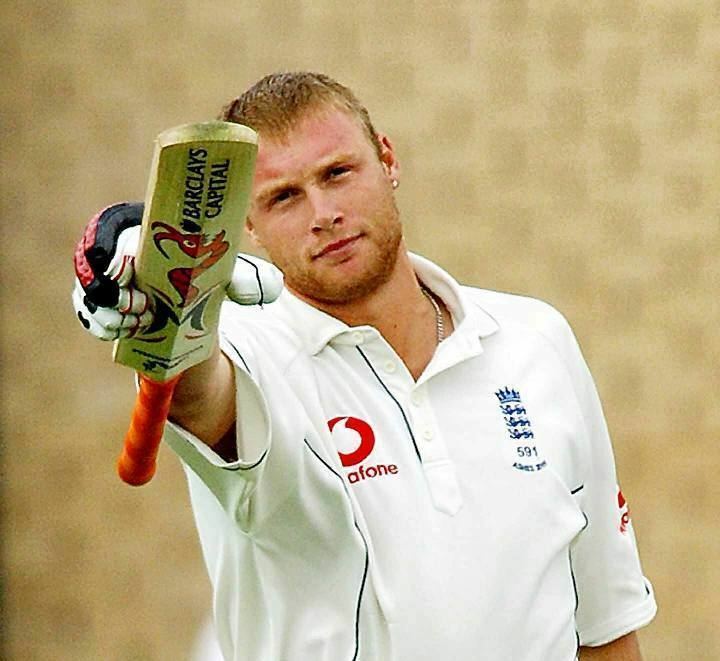 Flintoff holds the record for the most sixes scored for England, beating Ian Botham's record of 67 with a six off India's Piyush Chawla in Mohali on 11 March 2006. Flintoff is only the seventh player to have batted on all five days of a Test match, achieving this feat at Mohali, in the same match in which he broke the sixes record. He is one of only eight players to be on both the batting and bowling honours boards at Lord's. He currently holds 14 Guinness World Records in aid of Sport Relief. These include the fastest time zorbing 100 metres, furthest distance from which to score a bullseye and popping the most party poppers in a minute. During the 2007 World Cup, he got drunk with some of his teammates before an important game, and nearly drowned when the boat carrying them capsized. In a 2014 episode of 8 out of 10 cats, he claimed that he was attempting to sail home in a pedalo. He stated that he awoke on a beach – the worst place he had ever slept. He lost his position as vice-captain and was fined, but remained as a member of the team. In March 2010, Flintoff became a team captain on the Sky1 television sports panel show A League of Their Own, hosted by James Corden. In December 2010, Flintoff became a guest commentator during a number of matches in the 2011 PDC World Darts Championship event. He returned to commentary during the 2012 World Matchplay, where he called Michael van Gerwen's nine dart finish against Steve Beaton. He also currently hosts a radio show on BBC Radio Five Live on Monday nights. As of 2011 Flintoff has been named as the latest brand ambassador for big men's fashion brand Jacamo and had his own range produced in 2012. In early 2011 he also became the face of Morrisons supermarkets. Flintoff also produced a documentary entitled Freddie Flintoff: Hidden Side of Sport, about his and other sports stars' suffering of clinical depression. This was first aired on BBC1 on Wednesday, 11 January 2012. He also became a judge on the ITV talent show Let's Get Gold in 2012. In 2014, Flintoff made a cameo appearance in Sky TV series, Trollied. On 15 February 2015, Flintoff entered the first Australian series of I'm a Celebrity...Get Me Out of Here!, held in the Kruger National Park in South Africa. Entering on Day 17 of the series, he was crowned "King of the Jungle" after winning the series on 15 March 2015 after spending 29 days in the jungle. He is also a commentator for the Ten Network's Big Bash League and a regular panellist on their current affairs show The Project. In December, 2016 he hosted a second show in which he drove around Australia in a van, cooking food called "Freddie Fries Down Under" after previously hosting a show cooking Fish and Chips. Along with former Blackburn Rovers captain Robbie Savage, Flintoff is part of a BBC Radio 5 Live podcast called Flintoff, Savage & The Ping Pong Guy, hosted by former table tennis player Matthew Syed. Current and hot sporting topics are discussed on the podcast. Since July 2017, Flintoff was the sideline reporter for Australian Ninja Warrior on Nine Network. In September 2017, Flintoff was the main presenter for Cannonball on ITV with Frankie Bridge, Radzi Chinyanganya, Ryan Hand and Maya Jama as poolside reporters. In December 2017, Flintoff will host All Star Musicals for ITV. Flintoff married Rachael Wools on 5 March 2005 at the 30 Pavilion Road Hotel in Knightsbridge, London. They have three children: a daughter, Holly (born 6 September 2004); and two sons – Corey (born 9 March 2006), and Rocky (born 7 April 2008). He has the names Rachael, Holly, Corey and Rocky tattooed on his left shoulder. Flintoff's father, Colin, and his brother, Chris, both played cricket, with Colin still playing for Whittingham Cricket Club near Preston. During his innings of 167 against the West Indies at Edgbaston in July 2004, one six off Jermaine Lawson was hit high into the Ryder Stand and was almost caught by his father, who fumbled the ball and dropped it. Colin Flintoff remarked "If I'd taken it he'd have been the first Test batsman to be caught out by his dad!" Flintoff's cousin is John-Paul Flintoff, an author, broadcaster and journalist whose grandparents have "Flintoff Way" named after them in Preston. His career has been subject of a number of TV films and documentaries. In Freddie Flintoff: Hidden Side of Sport broadcast on the BBC One in 2012, he talks candidly in moving interviews with Steve Harmison, Vinnie Jones and Ricky Hatton and others about the serious effects of depression. He confronts his own issues as captain of England under pressure and under fire at the top of his game. Freddie reveals the stigma attached to talking about depression in the face of an often unforgiving public. In the documentary Flintoff: From Lord's to the Ring in 2012 broadcast on Sky 1, the cricket champion is followed in a 3-episode series while pursuing a possible career as a professional boxer under the guidance of trainers Barry McGuigan and his son Shane McGuigan. "Biggie", Sugar Ray Leonard, Mike Tyson make appearances in the documentary where Flintoff is preparing for a boxing match.